Writer: essayist, memoirist, sometimes journalist. “Buy Local” from authors who live and work in the Visalia area. We’ll be set up like a miniature festival with kiosks of a dozen authors and two artists. There will be refreshments and plenty of comfy places to sit while perusing the books you might like. In addition to supporting local writers, you will be able to chat with them about their work and get your books personally signed. There will be drawings for door prizes. What better way to spend a Sunday afternoon? This entry was posted in Uncategorized on May 11, 2015 by Carole Firstman. 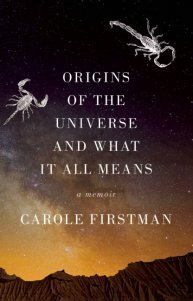 My manuscript, “Origins of the Universe and What It All Means: A Memoir,” has won the 2014 Dzanc Books Non-Fiction Prize, and will be published by Dzanc. It is scheduled for release in 2016. Dzanc is a terrific publisher and I’m honored to be selected. Woo hoo! This entry was posted in Uncategorized on November 30, 2014 by Carole Firstman.